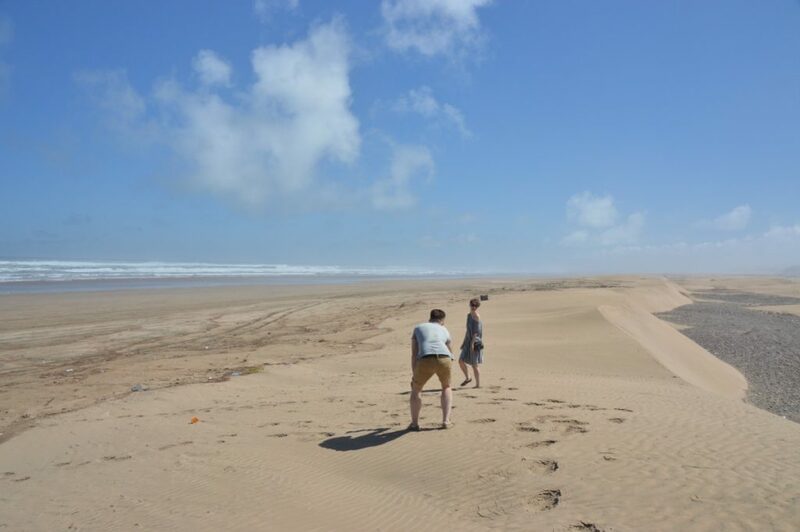 For a change in format, here’s a video tour from Casablanca to Dakhla! It may seem to you that the desert part of this trip has been going on for some time already, and from here it sometimes seems as if that is all there has ever been. 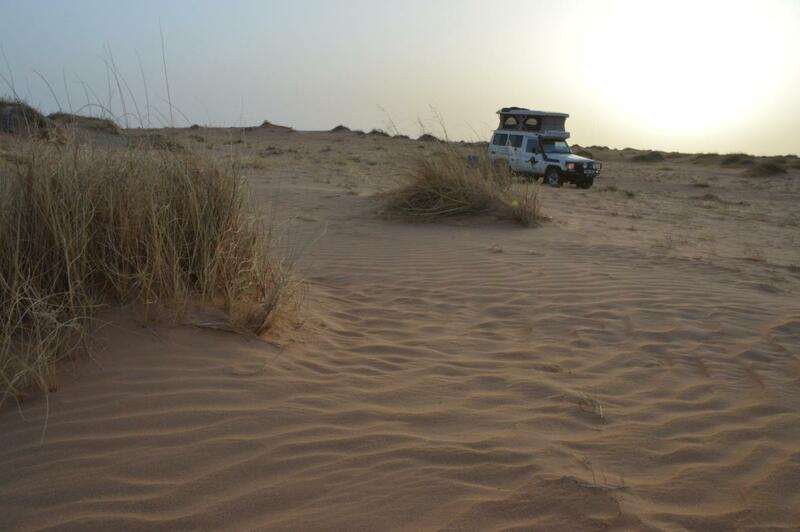 The Sahara is huge, but at the same time as varied in landscape as anywhere else. In that respect it reminds me of being at sea…though at least the desert’s varied landscapes tend to stay where you left them rather than changing with the whim of the weather! 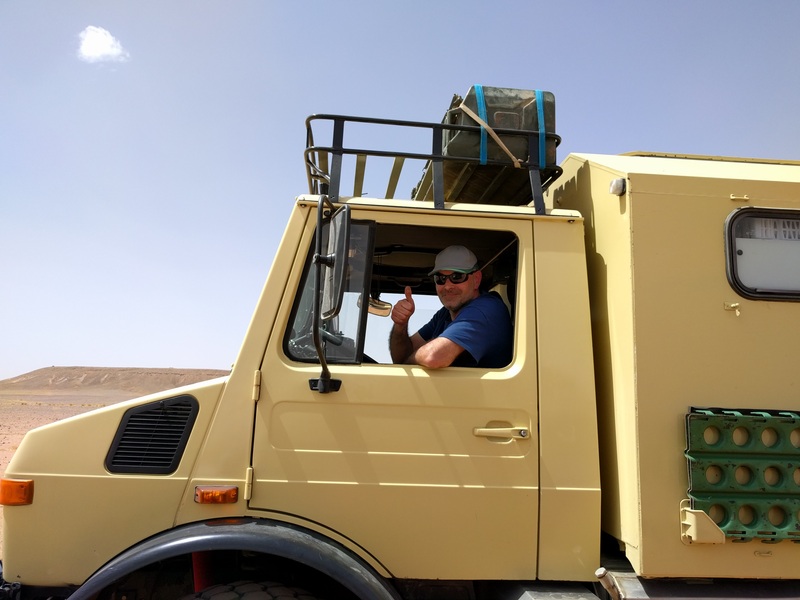 After a night in a hotel with a lovely pool and a cold beer to go with the Vegetable Tagines and nice (but cooked) salad, we were aiming to do some proper dune-driving as we tackled Erg Chigaga on the way out of the Moroccan (inland) desert section of the route. 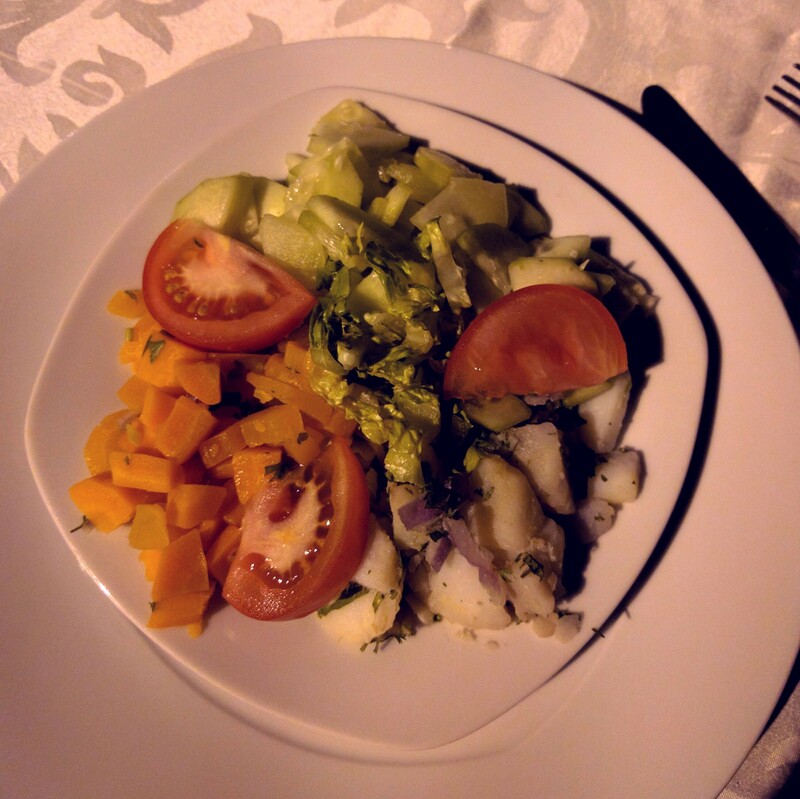 A successfully vegan, if perhaps uninspiring salad. So with tyres suitably deflated we headed into the rolling waves of dunes, steering a course in the general direction we wanted to go whilst weaving between the peaks and troughs. There were 4 main elements to the day’s navigations: To the South, a wide area of shallow, choppy riverbed made of crusted mud and rocky patches. To the North, a rocky shoreline along the edge of the Flat Dry Lake ahead. In the middle, the open sea of dunes we aimed to cross. We started out having a lot of fun with large, widely spaced dunes and little banks of sand and took the time to play and take photos. However, as we then progressed across a flat plain towards the next set of dunes on the horizon, we seemed to be being headed South of our rough route guide. This effect grew more pronounced as the dunes surrounded us, we could go mostly where we wanted but always being pushed South by the formations of wave-like dunes. We’d find some tracks, which would then disappear or curl back the way we came. So we’d cut our own path until we hit the next likely looking track. Skirting the Southern edge of some impassable feature, we’d point again at the target waypoint…until the next obstacle. 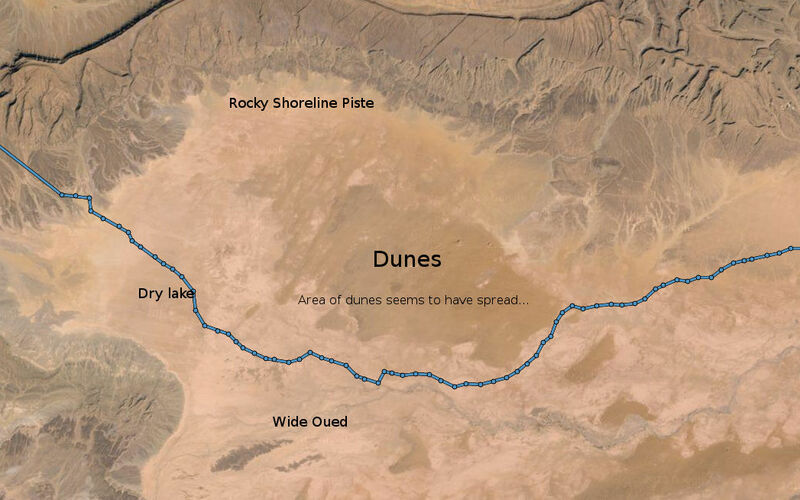 After a while it looked as if we’d passed the dunes and were on the beginnings of the dry lake, only for that to turn into a rough Oued which would push us further South. 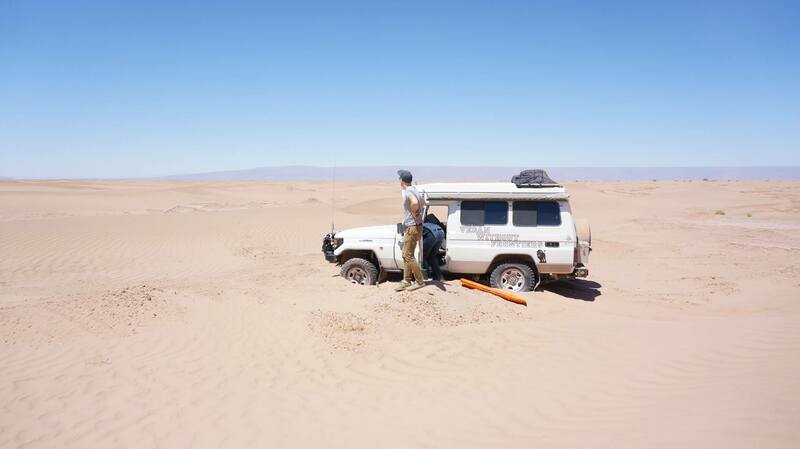 The final indignity was when we followed a collection of tracks heading exactly where we wanted to go…only to find it led to an encampment of French 4x4s, beyond which was a sea of short dunes of the sort one could easily get stuck in. Lots of fun if you have another vehicle with you to help pull you out in an emergency, but not a sensible place to go solo! We headed South again. 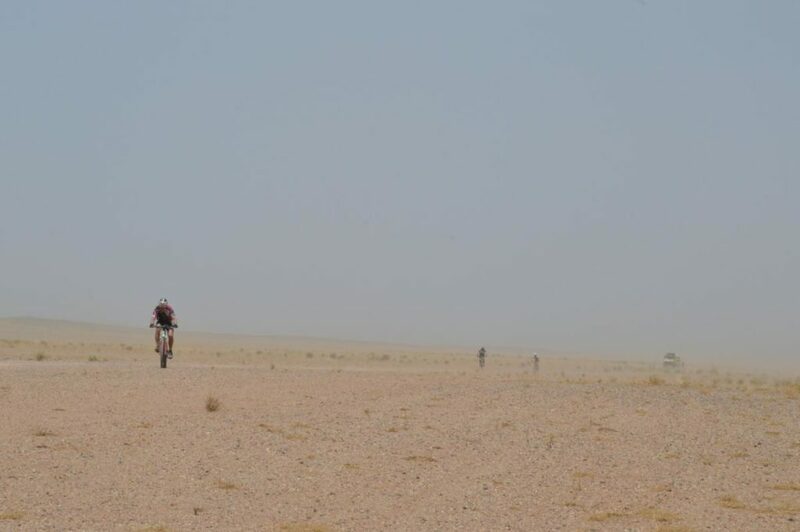 In the end, we skirted the Southern fringes of Erg Chigaga over small dunes and stepped oueds until the wide expanse of the dry lake allowed us to steer straight and make speed towards the far waypoint, and the track towards Foum Zguid. This turned out to be 25km of the worst sort of bone-jarring, Troopy-shaking, rocky, large-pebbled track with random deep little oued crossings. Finding a nice smooth tarmac road at the end of it was universally greeted with a sigh of relief! And so, via a photo stop near some impressive scenery, we made it to the night’s Hotel + Car Park Camping stop. Complete with pool (I went straight in), and the predictable evening meal of Vegetable Tagines. What next? We struck out for the Atlantic coast and the sea arches of Lezgira beach. It would have been lovely to stay there, where there was also the possibility of some paragliding, but after taking a walk along the beach we still had to make some miles towards the upcoming Plage Blanche section. I’m tempted to leave it at the title, and point you in the direction of Yury’s video for this stage, but I guess I should describe the days we spent off road along the Algerian border in a little more detail, since this was the highlight of my plan for Morocco! But in case you missed it…here’s the video again! Approaching Merzouga we passed alongside the dunes of Erg Chebbi – one of Morocco’s desert tourist highlights, complete with 4×4 and camel trips for day trippers and overnighters. It is apparently a tempting spot to go straight off into the sand for arriving overlanders, which can end in unfortunate bogged or rolled consequences. We settled for rolling into town and having tea at a cafe amongst a collection of tourist 4x4s and overlanders from France and Germany. Then we headed off onto the desert pistes – navigating by waypoints and whatever tracks were available. It was a bumpy and stony introduction, which later descended into a river bed of ultrafine feche-feche. But it was fun! 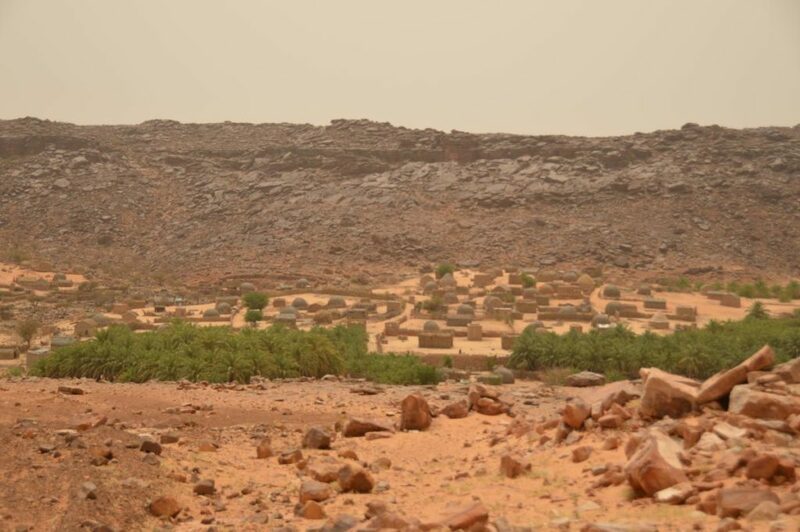 I guess I should explain feche-feche…the product of the occasional rain in these parts, it is basically the mud which gathers in the riverbeds, and is then baked in the sun for months, and churned into the finest powder by the passage of vehicles. It has no solidity, and when you drive into it it flows up over the car in a dry wave, then forms a clinging cloud. Get too deep in it, and you’ll need dragging out. Sand is a wonderful driving surface in comparison to this. 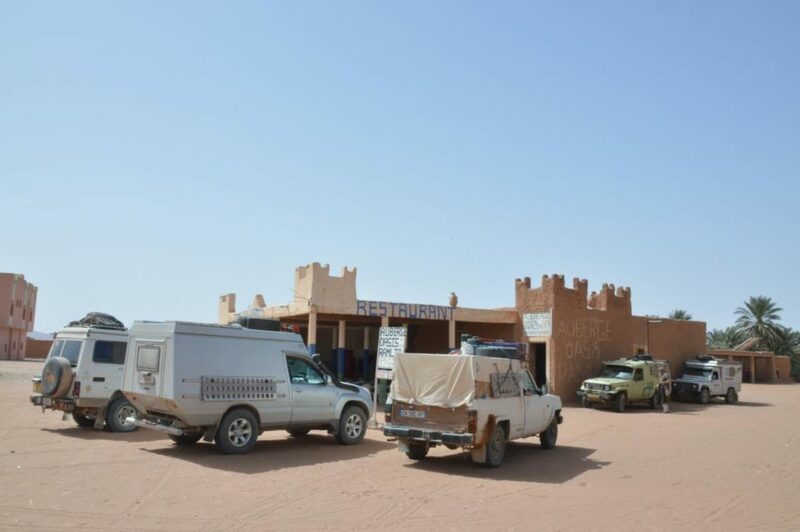 For the first evening, it was dirty and annoying, but not threatening to our progress – and we overhauled a couple of French Landrovers our route had converged with to get into clean air before stopping for tea, and then the night at Auberge Porte du Sahara. This was a lovely spot, with dunes behind and a view across the wide valley towards the mountains of Algeria (not IN Algeria as suggested by the DeLorme map!). 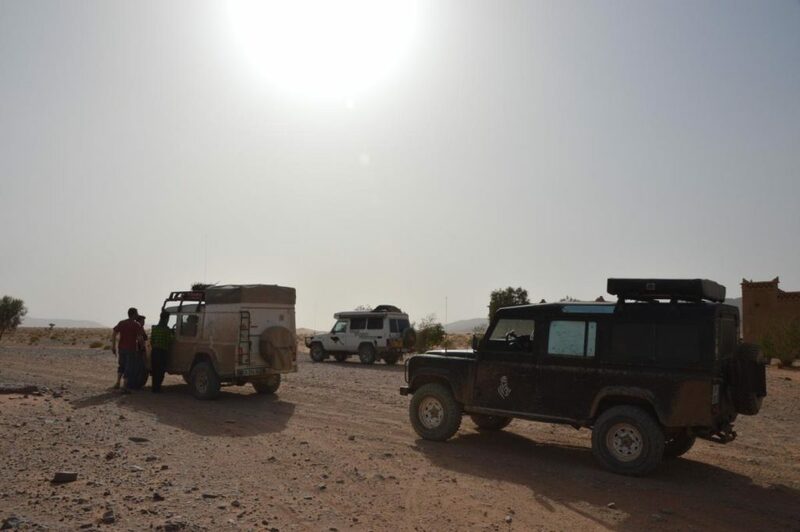 Now, the next stage had a prologue the previous evening, during which our friendly hosts had tried to convince us that the Oued up ahead was treacherous, and several 4x4s had needed rescuing recently after becoming planted in the feche-feche. Having experienced a little of the stuff on the way in, this was somewhat believable, and if it weren’t for the excessive fee they wanted, we might have been convinced to accept the offered motorbike guide through a detour. 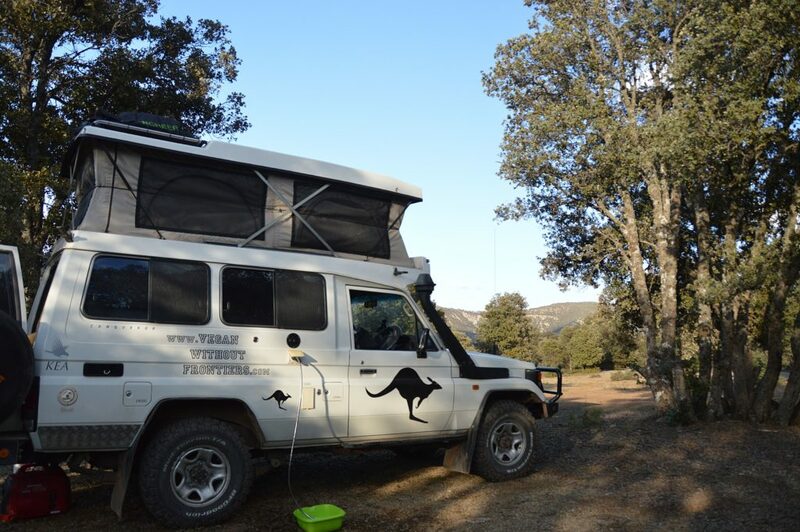 In the end, we headed on to Ramlia and stopped to chat to a group of various overlanders while deflating the tyres for the big crossing…which turned out to be a rather pleasant jaunt through some sandy curves for a few kilometres with no sign of the dreaded feche-feche. 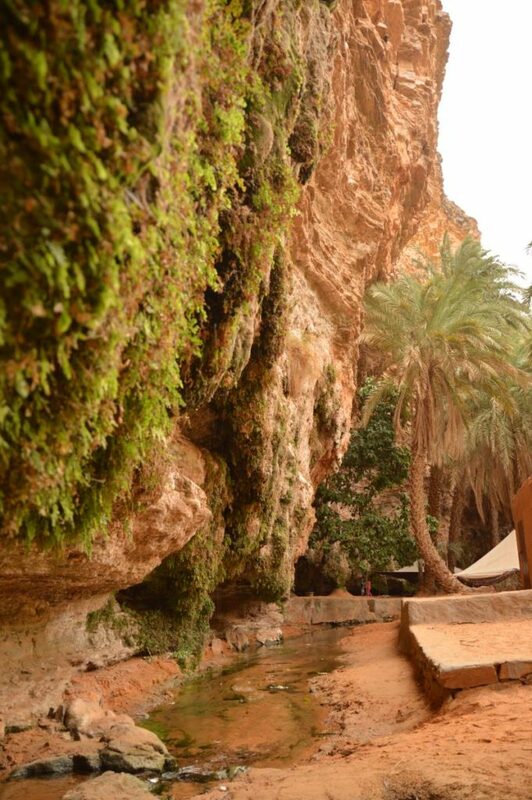 The Auberge Porte du Sahara Tripadvisor commentary will be positive, but not quite perfect! Anyway – another day, another hundred different lanscapes. We took the (apparently difficult) direct route towards Mahmid, across flat plains, rocky tracks, deep valleys and dry lakes. 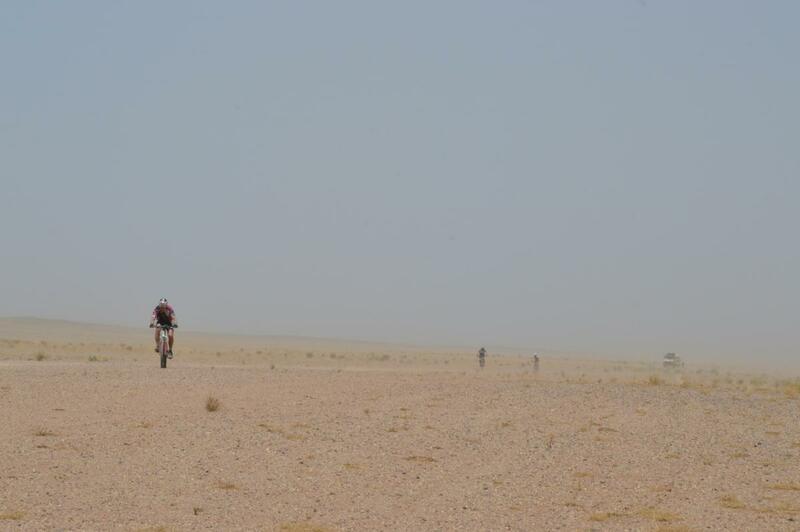 On the way, on a parallel track we overtook, then turned back to gawp at and applaud a group of cyclists doing an off-road tour race of the Moroccan Sahara. Their support-truck driver thought they were all crazy, and from our air-conditioned rolling home we had to agree they were indeed a little differently wired-up to most people. Crazy, awesome adventurers – and all the way into a fierce roasting headwind and blown sand. 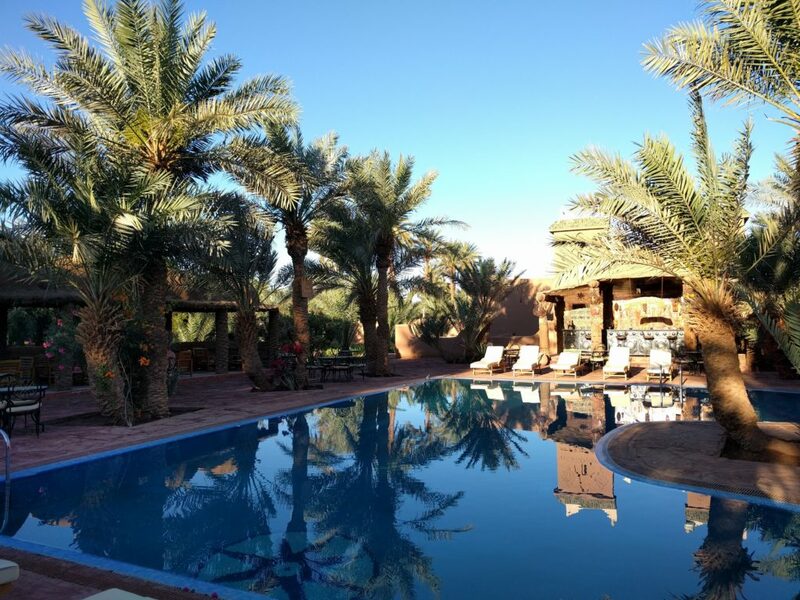 Mahmid…another oasis in the desert, and a hotel with a beautiful pool and a bar. 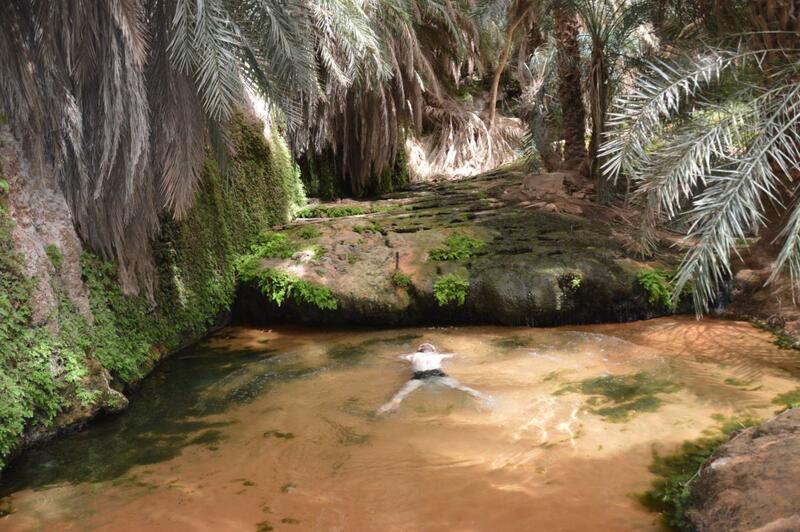 As I sit in Atar, Mauritania, writing this up in the late afternoon shade of a tree in conditions (and water consumption) reminiscent of our previous stay in Wadi Halfa, the thought of a cold beer and a swim is probably as appealing to me as a the hot sahara sun is on a cold, wet day in London. 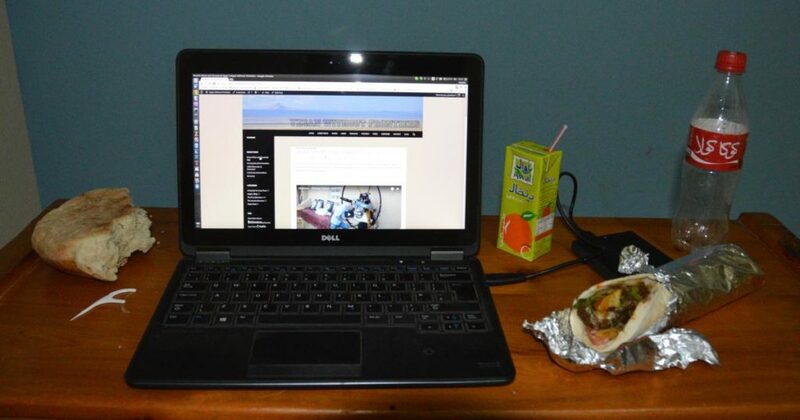 Its been a while since the last post – sorry! 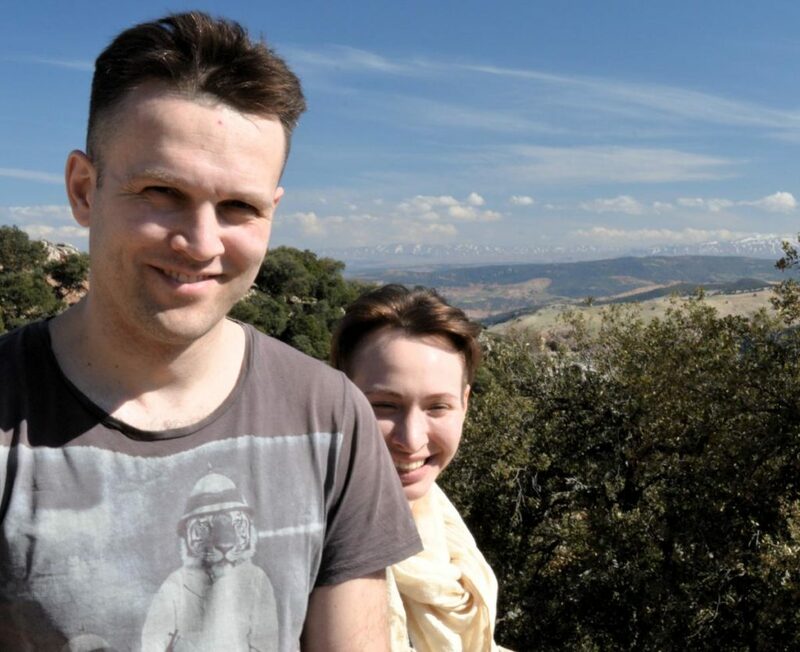 We were rather busy keeping to schedule to get Yury and Maria here to Dakhla on time for their flight home – a lot of miles, some of it without even tyre tracks to follow across the shifting sands and rocky dry riverbeds. But it was lots of fun, so here’s what happened: Part 1 – The Mountains. 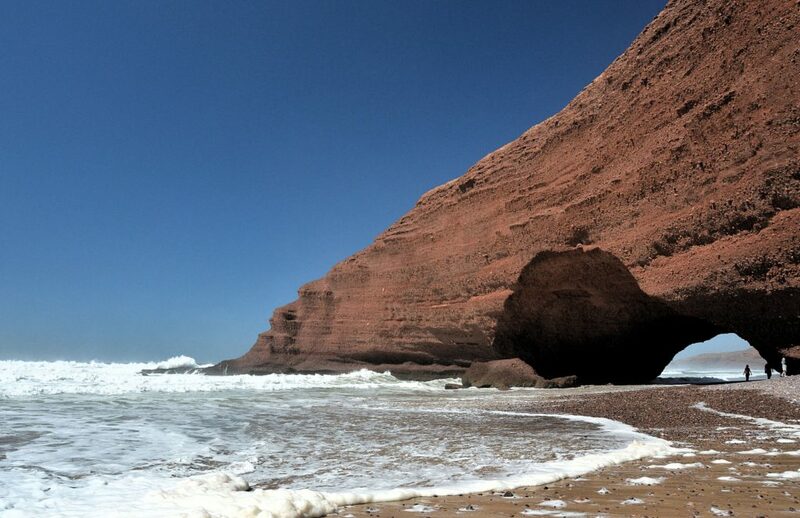 Personally, I couldn’t wait to escape from the busy Northern coastal area and head off for the more wild parts of Morocco. Yury and Maria found themselves hitting the ground running and having to adapt pretty quickly to life on the road, and we all had to adjust to the constraints of living together in a car! After a first day’s drive on modern motorways, a stop for lunch at a service area and mint tea in a cafe at a random rural town – we were straight into the first range of the Atlas mountains. I had a couple of waypoints on the map for potential places to stay, and a couple of route options. In the end we settled on a place marked as ‘bivouac wood’ – a wild camping spot just over the first range of mountains. The scenery during the day shifted from the big flat fields near the coast into rolling hills with a more patchwork pattern of crops, and then into rocky scrub-forested mountains as we climbed into the foothills. I started to breathe a little easier as we climbed and saw snow again on a small road which was being ‘upgraded’, so for now was a gravel and dust track. 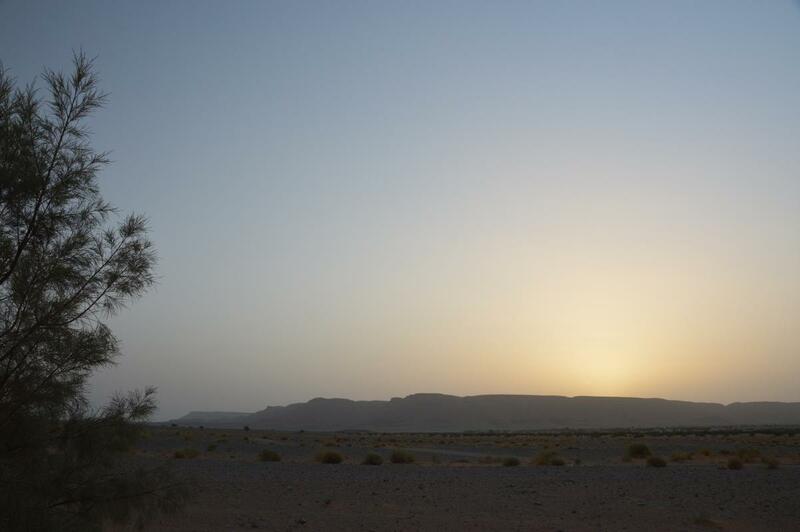 So began a week of ever-changing scenery…with only the sun, dust and the wind ever-present! Up in the mountains it was pretty chilly, even during the day, though the sunshine made for a pleasant warmth when we stopped to admire the views. 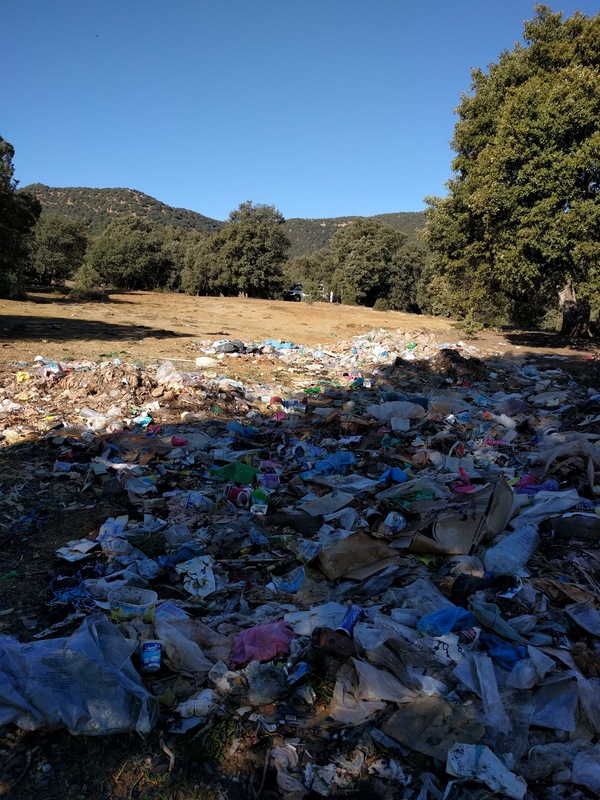 As we descended into the valleys there seemed to be lots of people in little villages, and groups of men strung out along the way doing preparation works and tree-clearing for the road improvements. We began to wonder how quiet our ‘bivouac wood’ was going to be, passing little campfires and groups of houses as we came within a few kilometres of the waypoint. But there it was, a clearing in the low trees at a bend in the road – with nobody in sight, though plenty of voices in the distance. We found a spot not too visible from the road and got the chairs out. I think my nerves at the first night wild camping had got transmitted and amplified in a rather shell-shocked Maria, but we got a campfire going and started to make dinner. At this point, a car stopped and a man and a boy were dropped off and came over towards us. First contact! They were actually very, very nice and had stopped to check we were OK, and to invite us to stay at their house…but we were all set up by then, so they assured us it was all good to camp there and said goodnight. Some time after dark another car pulled into the clearing…I walked over to meet the approaching (friendly) shadow – it seems this spot is also a place for younger locals to come and wind down away from the village. 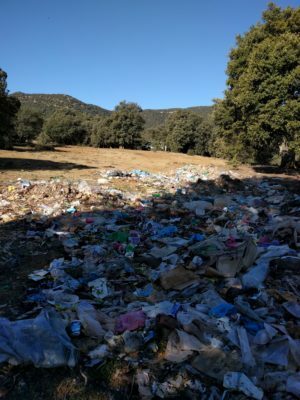 After some music and a little singing, they went on their way, leaving a couple of beer bottles on the pile at the end of the clearing…one suspects that apart from the generic attitude to dumping rubbish in these parts, beer bottles may be frowned upon at home? Actually I think the temperature stayed just above zero outside under the stars. 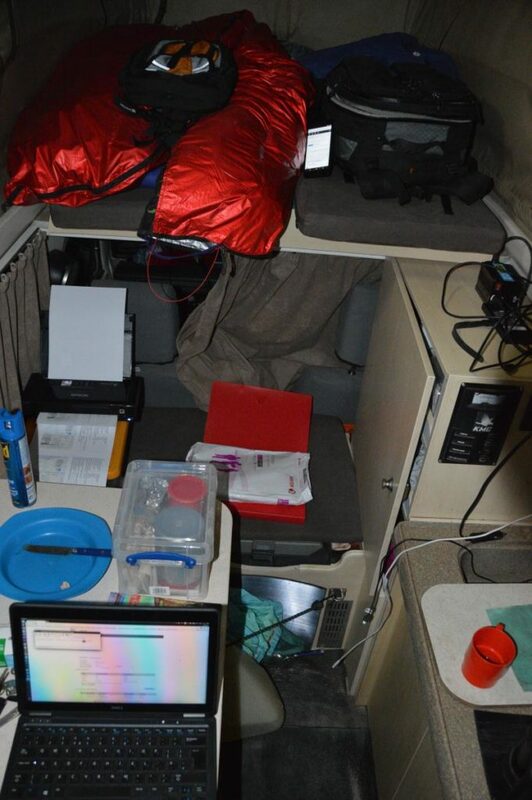 The campfire was still smouldering when we got up, but the roof inside Troopy was dripping condensation by morning. A baptism of sorts for my guests, and perhaps a bit much for a first night out of civilisation. So after some antique Namibian porridge for breakfast (mmm, bit stale) – it was off to the bigger ranges of the Atlas Mountains. Another day of changing scenery – majestic mountain views and busy market villages where we were for a while hemmed in by crowds and overloaded vehicles of all shapes and sizes. Even here, everyone seemed very friendly in a nice and relaxed way. Just not in a hurry! 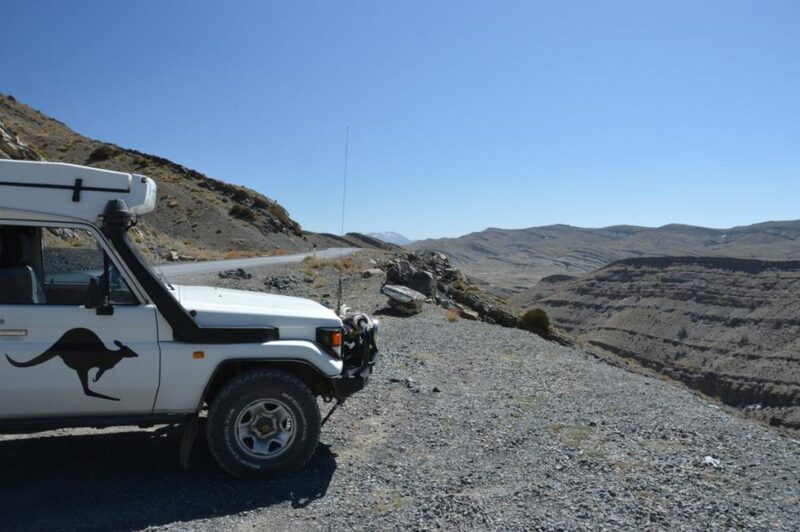 After climbing up a long and occasionally scarily overhanging road, which decayed to rocky track at the top, we emerged onto a high and dry plateau. Time for some gawping at views and then lunch. 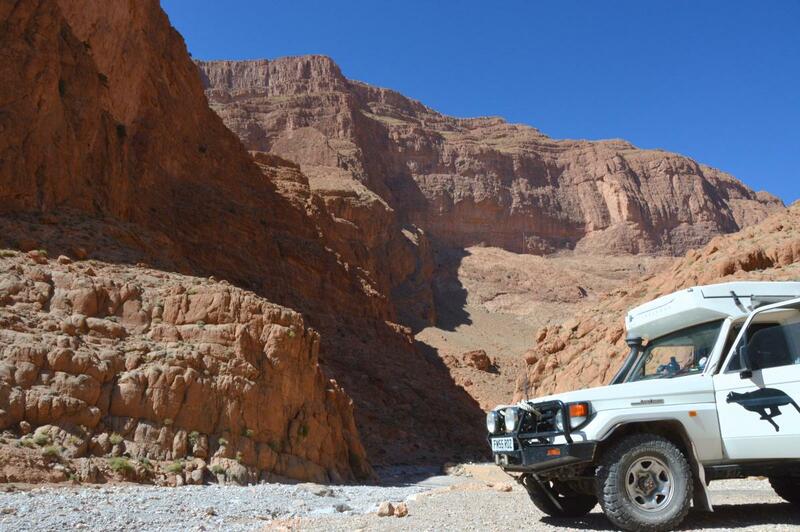 The afternoon was the same thing in reverse…dropping off the High Atlas into the Todra Gorge…described in my honest guide to overlanding in Morocco as ‘impressive but not spectacular’. It was impressive. Also for the first time an obvious tourist destination, with climbers and day-trippers admiring the views and the souvenirs. Even here, none of the pushy touting experienced in other places though. After the previous night, we figured a hotel would be nice…well a hotel room for Yury and Maria, and a secure parking area and a whole Troopy with access to facilities for me! 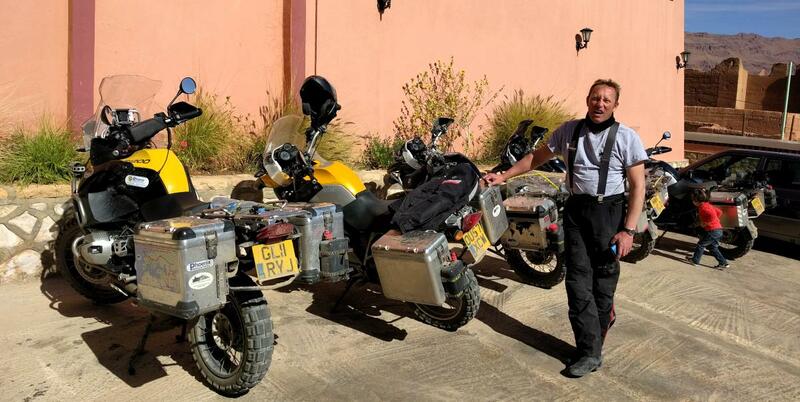 Here we met a bunch of British bikers who arrived after dark having got into some trouble involving a narrow ledge and a riverbed earlier in the day, fortunately the breakages were limited to the bike and not the rider. Gareth – biker and flying boat pilot. It turns out that Gareth also flies a Catalina Flying Boat for fun and entertainment when he’s not off-road biking in Morocco! We had a good exchange of tales in the morning, which accounted for a slightly late start! Meanwhile the nice security chap at the hotel filled my water tanks and offered me use of his staff facilities. Then we were off to the Sahara. Vegan Viewpoint? 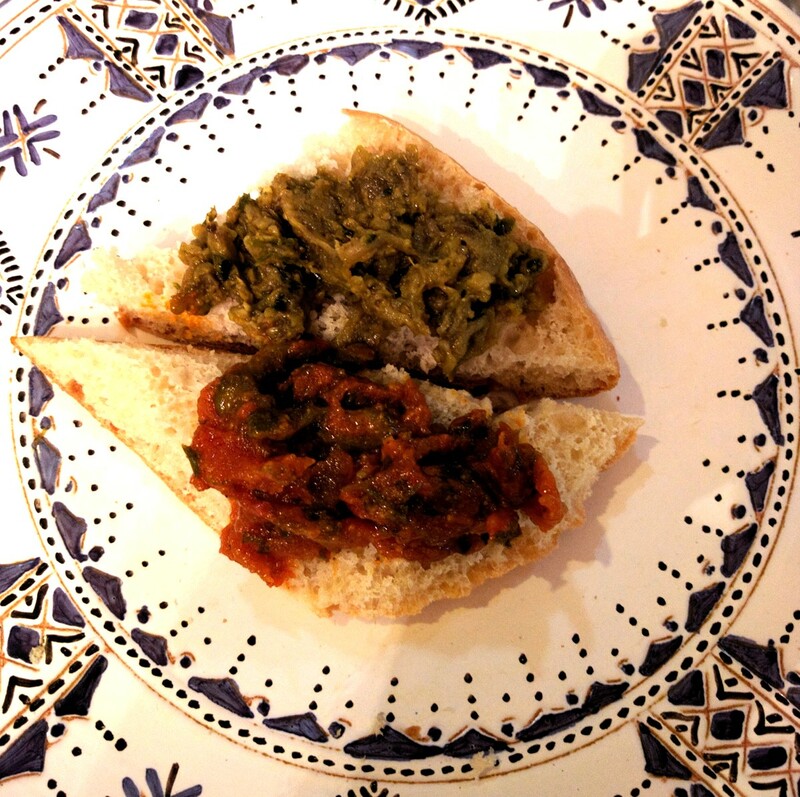 This was all pretty successful from a ‘mission’ point of view – we were making our own food after all so were in control, though how the hotel would have done we don’t know as the kitchen had closed by 8.30pm when we went to find dinner!